The DfT has issued a Rail Franchising Schedule that shows proposed extensions to most existing franchises. East Coast will return to the private sector in 2015. 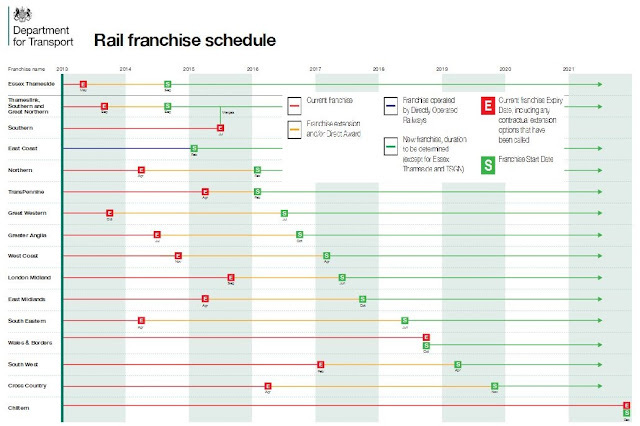 The current Cross Country franchise is likely to be extended until the end of 2019 and Great Western would be extended until mid 2016 via an extension of the current deal. TransPennine could be extended by ten months and the new proposals could give Virgin until April 2017 representing an overall delay of five years when compared to the original plans for the new franchise to run from 2012.